0n 1st February 2019, The Zimbabwe Open University, Matabeleland South Regional Campus staff joined Zimbabweans in the national clean-up campaign in support of the initiative by His Excellency, The Presidentof Zimbabwe and ZOU Chancellor, Cde. Emmerson D. Mnangagwa who launched the national clean-up campaign on 5 December 2018. The national clean-up campaign is an ongoing activity and is to be conducted on the first week of every month. 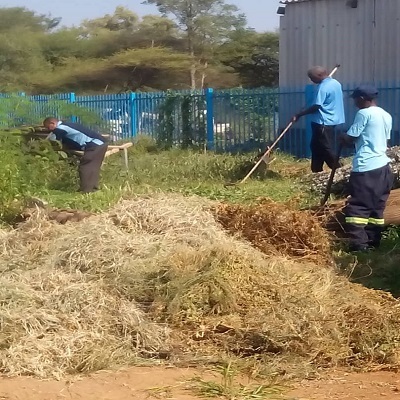 The campus had a very successful clean- up campaign, which saw all staff members fully engaged in cleaning and beautifying the campus, a move meant to enable the university to live in a safe, clean, tidy and user friendly environment. This 1st cleaning exercise was concentrated inside and around the campus premises. The Matabeleland South Regional Campus Regional Director, Mr. A. Nkala led the cleaning exercise. It was noted that every staff member had a task to carry out, all in the spirit of cleaning the campus.For Mat South Regional Campus staff, it was quite an experience, and everyone felt the two hours was rather too short. The SRC president, Mr. Chamunorwa Mahachialso joined the Mat South team in the clean-up campaign.